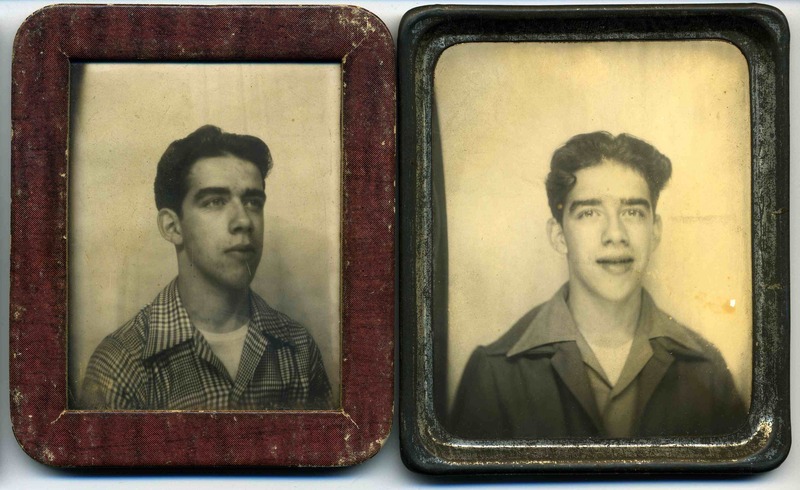 These two undated, photomatic photos from the USA, of a young, possibly handsome, possibly weird looking boy, were probably taken in the 1940s. I can’t make up my mind on his looks one way or another. Those chunky lips and bushy eyebrows are slightly suspect and take him in alternate directions of attractiveness depending on my mood. Today, I am sleep deprived and hungry, so my attitude isn’t too positive towards him at this moment. That’s it. I’m done. Nothing more to say. This website and its content is the copyright of Katherine Griffiths © 2011- 2018. All rights reserved. I do not own copyright of images where it is stated that they are not part of my personal collection or which have been loaned to me. You may not, except with express written permission, distribute or commercially exploit the content. Nor may you transmit it or store it in any other website or other form of electronic retrieval system. I’m in for weird. Something very odd about the photo on the left. Actually the same for the photo on the right, just a bit less so. If he had been my neighbor, If might have kept my child away from him. Katherine, order a pizza. My treat. Tee, hee! Thanks for the offer of pizza. I’d prefer toast or cornflakes. It is 8.30 am here. Breakfast time. And coming on the fall for you. No pizza, no breakfast, I’ll buy you lunch. That’s too funny. I know what you mean. Elements of his face are conventionally handsome, and yet the combination of parts is quirky. He has one of those faces that would depend a lot on his personality. If he’s a great guy, then that’s a face you could adore. But if he’s got a crappy personality, then that’s a face that could easily be irritating or even repulsive. Fun photos in either case. Yes he could have turned out to have “a face you’d like to slap”! Ah, yes they are out there!! I also think it’s an intriguing look – and that if he was a nice guy, you could say he has a lovely face. Get some toast down you. Yep, I agree with you Helen. Another day and I am once again, tying breakfast-less. Toast and vegemite coming up! There’s a lot to be said about the aesthetic of the young man; however, one might imagine that he looks a little different now. Well into his 80’s… ? We were all hansome once. Isn’t it a shame that these people become anonymous like this? Their memory discarded into a yard sale, thrift store, or probably more often, the rubbish heap. If he’s American, then I guess the betting is good that he never had Vegemite on toast for breakfast (or lunch). I know you are Canadian! But that comment really confirms it. Do you do marmite instead of vegemite like other Commonwealth countries? Well, I was born in the UK of British parents and move to Canada at age of one, so I do know what Marmite is though I never liked. Us Canadians (at least the west coasters) just don’t do ___ite yeasty dressings for dried toast. Its not our way. But you can buy it here, must be enough expats to make it worthwhile stocking it. Yes, I imagine the French influence would work against that particular Anglo vice! I am totally a “Vegemite Kid” as we say here. I have it pretty much every morning on my toast. Very rich Sue. Well extrapolated. And hopefully he got home safely! Thanks for the great comment, Sue!